Welcome to Rome. A weekend of prayer, study, eating, exploration, meetings and celebration is scheduled, beginning on Erev Shabbat, 17 May, and finishing with a gala dinner on Sunday evening, 19 May, where Beth Hillel Roma will celebrate its fifth anniversary. Dinner to celebrate Beth Hillel’s fifth anniversary. There are limited places remaining to attend this dinner, for which a fee is payable. Please contact Ben Fantini for more details at bethhillelroma@gmail.com . The weekend will also be an ideal opportunity to meet, engage with and hear from the EUPJ Management Committee and Board Members and to meet members of our Italian communities. Please note: All events will take place at the Grand Hotel Gianicolo, Rome. Delegates must book their own transfers and hotels. We have negotiated special rates. Deadline for registration 1 May 2019. Kindly note that the dress code is smart casual to formal for the religious services and formal for the gala dinner on Sunday evening. A 20 minute downhill directed walk with Ben or a taxi from the hotel. The guided tour will be on flat, cobbled streets. An audio-system with headsets will be provided. This is not “just” a tour; this will be an experience that will take you into the discovery of the treasures of Rome, through space and through time! We will start with the Jewish quarter, once a “ghetto”, but in modern days one of the trendiest of the city, full of life and great food! 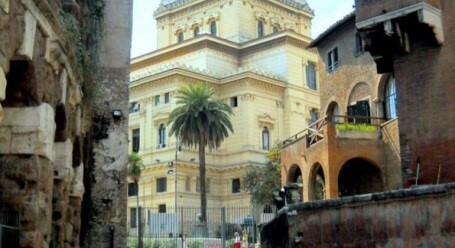 The Jewish community of Rome is the oldest outside Jerusalem, as the first Jews settled in Rome almost 2.200 years ago, and there has always been a Jewish community here throughout all those centuries. A history and commentary of the Jewish community will be included, as we walk around the Great Synagogue* and through the tiny streets. Of course being Saturday, the Jewish Museum and the Great Synagogue will be closed to visits. 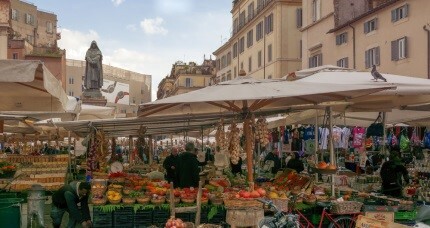 We will proceed onto the square of Campo dei Fiori, once used for public executions, today there is the most famous daily morning market for fresh fruits and vegetables, and in the evening a great meeting place. 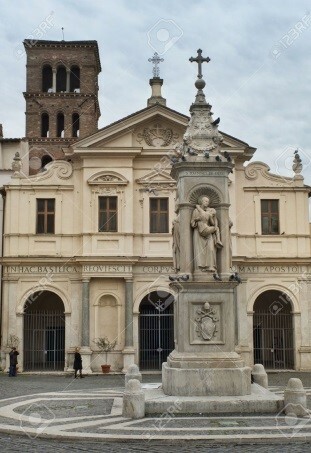 We will see the plate on the pavement to remember the burning of the Talmuds in 1553 by Cardinal Giampietro Carafa, head of the Roman Inquisition. 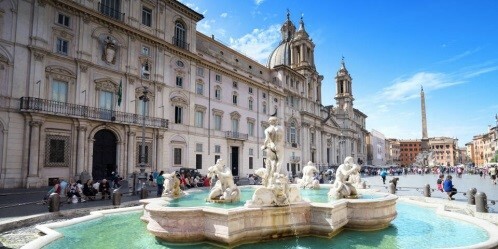 From there just a short walk to Navona Square, the so-called “living room of Rome”, featuring the beautiful fountain of the Four Rivers, made by the baroque artist, Gianlorenzo Bernini. Walking further down, passed the modern Senate House, we will find the Pantheon**, the best preserved roman temple, going back 1900 years.. It’s one of the most extraordinary buildings of antiquity, for its architecture as well as the purpose for which it was built. Then going through a maze of streets we will see the Parliament and the Seat of Government, where in front we will discover the beautiful marble column of triumph dedicated to the roman emperor Marcus Aurelius. Leaving Colonna Square we will go through a gallery inside a 100 year old building, to reach the Trevi Fountain. Tossing a coin is a must if you want to come back to Rome! And last, but not least, the Spanish Steps where we can take a look at the designer shops! There are taxis available from the square to go back to the hotel or Ben will direct you to the hotel, stopping at the best Gelato in town. (fee payable). *The Great Synagogue/Museum is open Sunday –Thursday 10:00–18.15, Fri 9:00–15.30. There are hourly tours and an entrance fee charge. **The Pantheon is now a church, and on Saturday afternoon it closes down for mass at 4.30 pm, and reopens at 6.00 pm, last entrance is at 7.00 pm. There is no entrance fee. Hotel reservations should be made at Grand Hotel Gianicolo where the services, meetings and dinner will take place. Please contact the Event manager, Mr. Massimiliano Rinaldo, event@grandhotelgianicolo.it to make your hotel booking. All prices include breakfast, WIFI and use of the pool. Just situated some 1.9 km from the Vatican, 2.4 km from the Pantheon and 3.4 km from the Colosseum. 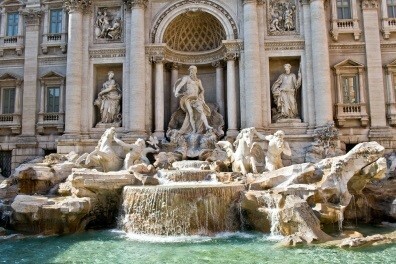 The hotel can arrange private car service from/to Fiumicino or Ciampino Airport. ERA rabbis are invited to join the Kallah Sunday 19 – Monday 20 May 2019. 1.1 The agreement for your booking is formed when EUPJ receives part or all of the payment required (if any) to attend the event named on the registration form (the “Event”) and/or when EUPJ has sent you written confirmation via email (the “Confirmation”) of registration of your place at the event. 1.2 This agreement binds you and all delegates (the “Delegate“) named on your registration application. It is your responsibility to ensure that all delegates for whom you are booking are aware of, and accept these terms. This agreement continues until the last of your delegates has left the venue where the Event is held (the “Venue“). 2.1.All registrations are taken on these terms and conditions only. 2.2 Registration applications are processed on a “first come, first served” basis (by received time and date). From time to time a waiting list may be operated. 2.3 Bookings for the Event must be made through the EUPJ website www.eupj.org and accompanied by full payment, if the Event is one for which payment is required. 2.4 Bookings close at the time specified on the booking landing page on the EUPJ website. Please make direct enquiry to administrator@eupj.org if you wish to apply for a place after this date. 2.5 All bookings for an event which carries a fee must be paid for in full by the date specified in the booking form. 2.6 Your payment, if any, to EUPJ will cover the items set out in the booking landing page and/or booking form for the event. 3.2 A limited number of subsidies are available from EUPJ towards the cost of travel, hotel and fees for the Event, and can be applied for to a maximum of £275 or €300 per person. An application should be made by email to administrator@eupj.org and will be referred for decision to be made in his absolute discretion by the Honorary Treasurer of EUPJ whose decision shall be final. Your travel arrangements to the Event. Your hotel accommodation with the hotel you select. Your transport to and from your hotel. Transport to and from the Venue(s) unless included in the Event. Any ‘extras’ you incur at your hotel e.g., gratuities, drinks, room service, laundry etc. Any car parking charges at the Venue. Your insurance e.g., cancellation insurance for cost of travel to the Event, property loss, medical expenses. (See also paragraph 9 below). 4.1 The hotel that you or any non-delegate partner or guest of a delegate select and require, must be booked and made by you or any non-delegate partner or guest with the hotel directly. 4.2 EUPJ is not responsible for your hotel reservation and confirmation. Such reservation and confirmation will be subject to the hotel’s own terms and conditions which you should obtain from the hotel directly. 4.3 You must vacate your hotel room by the checkout time notified by the hotel for your day of departure. 4.4 A non-delegate partner or guest of a delegate, who is not registering to attend the Event as a delegate, is not entitled to any of the meals or other food and beverage at the Event unless they have registered online for the Event. 4.6 EUPJ accepts no responsibility or liability for any illness, damage or personal injury caused to a delegate or non-delegate partner or guest of a delegate staying at a hotel. 5.1 All catering at the Event will be either vegetarian or fish. 6.1 All workshops, seminars and optional events at the Event are advertised in good faith but circumstances beyond EUPJ’s control may result in amendments or cancellations when EUPJ will endeavour to give as much notice as reasonably possible. EUPJ shall have no liability for any amendment or cancellation made to any proceedings at the Event. 6.2 Where spaces are limited, all workshops, seminars and optional events are offered on a first come, first served basis. 6.3 All speakers at the event are attending on their own behalf and EUPJ is not liable for anything they say or do. It is a condition of registration that behaviour as a participant will not bring EUPJ into disrepute. This includes settling any “extras” you incur with the hotel on departure. 8.1 Personal information given by you will be handled by EUPJ in accordance with UK Data Protection Act 1998 and the new GDPR regulations. 8.2 EUPJ will only pass your name and any other personal data to a third party service provider (such as caterers or security) as may be required by them to comply with reservation, safety and security policies and procedures. 8.3 EUPJ will publish a delegate list (consisting of delegate name and email address) which will be distributed to all delegates attending the Event. If you do NOT want your name to be published on the list, please email administrator@eupj.org. 8.4 EUPJ will use your email address to acknowledge your registration application electronically. EUPJ will also keep you informed about future events and add your details to its Newsletter distribution list. If you do NOT wish to be sent further emails, other than those relating to the Event, please email administrator@eupj.org . 8.6 EUPJ, its agents and other participants may take photos, audio or video recordings at the event which may be used for marketing, promotional or educational activities. EUPJ does not accept responsibility, if contrary to your wishes, you appear on audio or video recordings or in photographs. It is your responsibility to ensure that if you see that you are being recorded, you notify the person doing the recording, if you wish to request any limit on the use of such recording. 9.2 Instead of cancelling, you may send an alternative delegate, without incurring additional fees. You must inform EUPJ at administrator@eupj.org and provide all the substitute person’s contact details no later than ten full days before commencement of the Event. Any required alterations to travel and hotel booking arrangements must be made by the delegate directly with the travel providers and hotel (not through EUPJ) in accordance with the terms and conditions of such providers and the hotel. 9.3 Any refunds agreed by EUPJ will be processed and paid within 60 days after the end of the Event. EUPJ is unable to make any refunds before the Event. 9.4 EUPJ reserves the right to cancel the Event or vary any part of the Event at its discretion. If the Event is cancelled the maximum liability of EUPJ is the return of any money paid by a delegate or by a non-delegate partner or guest of a delegate to EUPJ. Your own travel insurance needs to cover any other costs which you might incur if the Event is cancelled. 9.5 EUPJ will not be liable for any failure or delay in the delivery of the Event or any element of it which is caused by the failure of the Venue to deliver its services, any act of God, workers’ action, or any other circumstance beyond EUPJ’s control. 9.6 The Event is intended for individuals who are members of or who represent organisations which are, in turn, Constituent Members or Associated Members of the EUPJ or of the WUPJ and its affiliates or any other person whom the Management Committee of EUPJ (in its discretion) (“ManCom”) considers to be in sympathy with the mission and objectives of the EUPJ. The Event may also be attended by any other person specifically invited or permitted to attend by the ManCom of EUPJ. Accordingly, the EUPJ reserves the right to refuse to accept the registration of any Delegate or other person seeking to register to attend the Event or to cancel the registration of any such Delegate and/or person if ManCom, in its sole and absolute discretion, believes that such a person does not meet the above criteria or for any other reason which ManCom considers reasonable in the circumstances. Should EUPJ exercise any of its rights referred to in this paragraph 9.6, then the provisions of paragraph 9.4 above shall apply, mutatis mutandis, in respect of any liability of EUPJ to any Delegate or non-Delegate partner or guest of a Delegate. 10.1 You accept that neither EUPJ nor any person involved in the Event shall have any liability to you for any injury, loss or damage, including as a result of negligence, suffered by you or other participant during the Event, other than for death or personal injury caused by negligence. 10.2 These are the only terms and conditions which apply to you and EUPJ relating to the Event and supersede all other understandings. 10.3 No third party may rely upon these terms and conditions. 10.4 These terms and conditions are governed by English law.